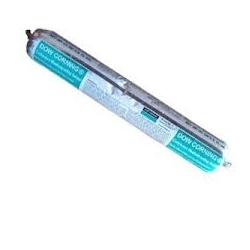 Dow Corning contractors weatherproofing sealant sausage (CWS) is a one-part, moisture cure, medium modulus sealant that provides durable, pliable, watertight joints and offers outstanding adhesion without priming to most non-porous substrates. With its unique weather-resistant formula, it possesses a balanced adhesive strength and very high recovery, making it ideal to withstand adverse weather conditions in common installations including moisture, movement, sheer, and de-flection. It is easily gunnable in all weather conditions from -20 to 120 degrees F. Because our Dow Corning contractors weatherproofing black silicone caulking requires no mixing and a smaller joint ratio, it is an economical, high-performance alternative to other comparable sealants with a ±40 percent movement capability. Dow Corning Contractors Weatherproofing sealant may be used on concrete, but the surface needs to be primed with Dow Corning Primer P prior to application. It is recommended that an adhesion test be performed on a small section of concrete to ensure that the bond is within specifications of your project.